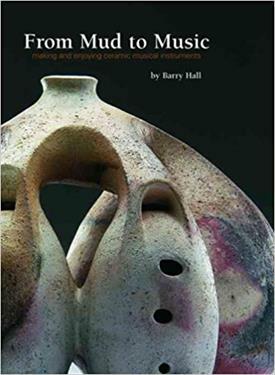 This book is about a truly remarkable transformation: how the simplest of materials clay or mud can be used to make tools for producing one of the most complex human expressions music. With a history reaching back to ancient times, creating ceramic musical instruments is a vibrant pursuit for many innovative artists today. From Mud to Music explores the vast array of ceramic musical instruments, from their historical traditions in world cultures to modern variations and innovations. All instrument families are represented: percussion, winds, strings, and even unique hybrids. For each type of instrument, special construction techniques specific to clay are explained. In addition, there's a chapter providing detailed, step-by-step instructions showing how to build several ceramic instruments. A companion audio CD contains 43 diverse tracks of ceramic instrumental music ranging from the refined melodic strains of Vivaldi and Tchaikovsky to the earthy, primal wailings of bizarre pre-Columbian wind instruments. Hundreds of color photos present the work of artists from around the world spanning the last 3000 years, from ancient Peruvian water whistles and Mesopotamian rattles to contemporary seven-chambered ocarinas and ceramic bagpipes. In-depth profiles explore a number of today's artists, their work, and their inspirations. Whether you are a musician, ceramist, or just a fan of art and music, you are invited to embark on an incredible journey...from mud to music! From Mud to Music includes a CD of music performed on clay instruments featured in the book. So you not only get the opportunity to see the variety of shapes of these clay instruments, you get to hear them in action. Performed on a huaca and ehecatl built by Rafael Berjarano. Performed on a clay shaker and Claypans built by Stephen Wright. Performed on ceramic horns built by Barry Hall. Performed on a ceramic barrel organ built by Geert Jacobs. Performed on a clay violin built by John Stevens. Some potters find their voice in the clay; sometimes the clay gives voice to the music within. Very often, we cannot fully control what comes to life on the wheel. Many times, the clay will tell us what it should be, how it should form. We are partners in the process, not the masters. We must incorporate our vision of what the clay can become with what it wants to be. We hear its music, and when we're lucky, we can bring that music to life in form, shape, and sound. The primal voice of ancient civilizations lies within its musical instruments. All we need do to unlock a link to the past is draw breath, draw back a bow, raise a mallet or a hand and the sounds of the past come rushing across the great span of history, spilling into our consciousness. It is truly a remarkable experience to hear the sound of ancient instruments that last sounded thousands of years ago. The people may be gone, the civilization shattered for whatever reason. But we can travel back in time, hear the sounds they heard, by listening to (or even playing!) musical instruments of their time. Few of us will ever have the honor of playing an authentic instrument from an ancient culture. But we can explore our connection to cultures of ancient ages, hear the music of their time played on instruments of our own making instruments made from the very same material: clay.